In the age of digital diplomacy, governments often turn to social media following a crisis, be it a terror attack or natural disaster. Social media may be used by governments in order to comment on crises as they develop, offer a narrative of events and demonstrate that the government is functioning and attempting to regain control of the situation. However, failure to communicate a narrative of events following a political crisis can result in two negative consequences. First, social media users, networked individuals, bloggers and traditional media can spread their own interpretation of events, which may be highly critical of the government. Second, such online criticism may tarnish the image of the government and country in question. Thus, timing is of the essence during political crises. The recent coup attempt in Turkey offers a relevant case study for crisis communication in the digital age. 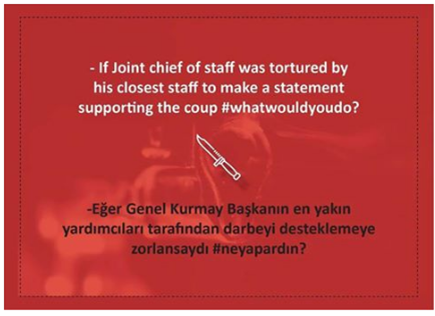 During the night of July 15, as Turkish soldiers attempted to stage a coup and oust the Turkish government, Western diplomats took to social media in order to denounce the coup attempt and pledge their support to the democratically elected Turkish government. 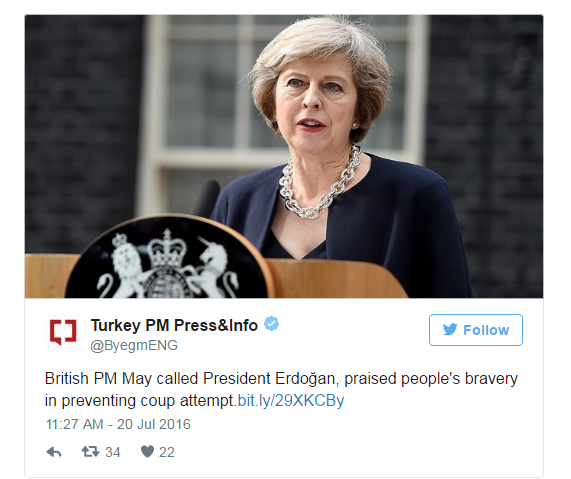 Yet in the days following the coup attempt, the tone of Western diplomats altered dramatically given the mass arrests and detentions of civil servants, academics, teachers and military personnel by the Erdogan government. 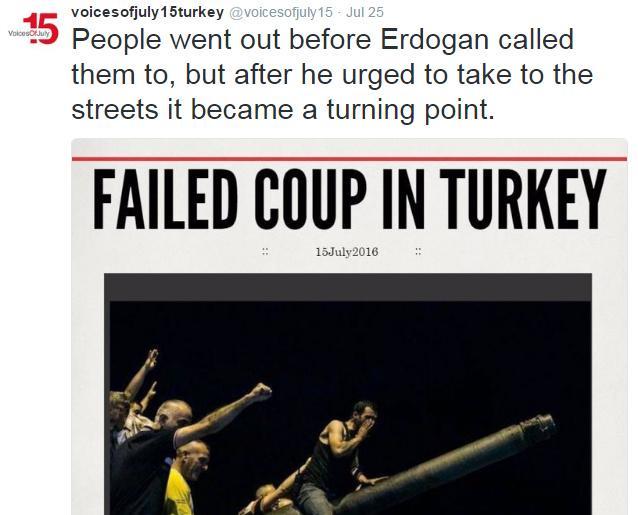 Similarly, the online discourse regarding the coup also altered as the trending hashtag changed from #TurkeyCoupAttempt to #TurkeyPurge. Notably, during the crucial first two days following the coup attempt Turkey's official social media accounts all lay dormant. 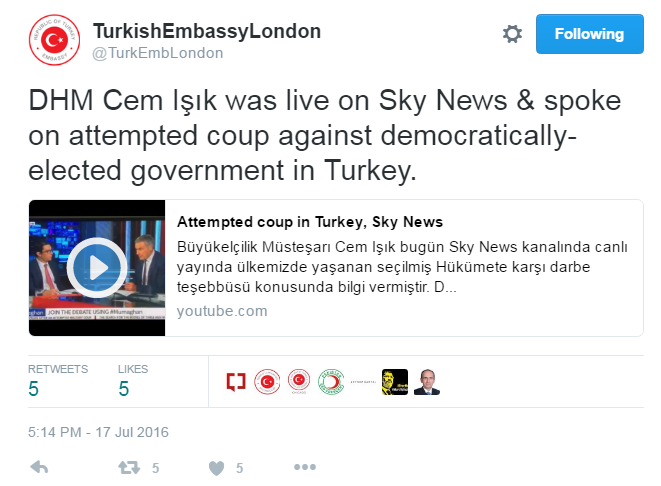 The Turkish foreign ministry did not respond to allegations of a purge and Turkish embassies did not tweet their narrative of events. 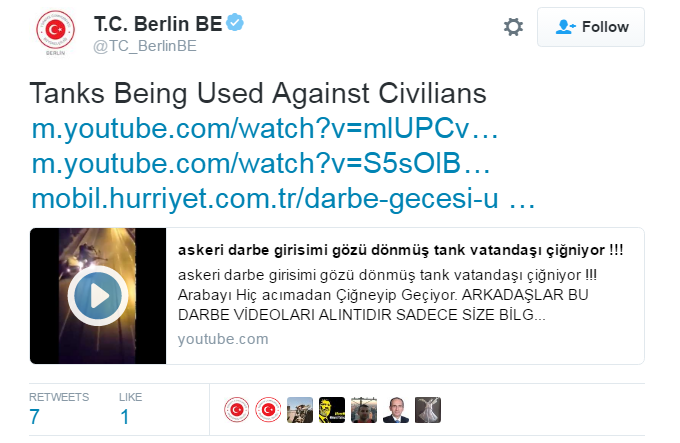 Even President Erdogan's social media channels were mute. 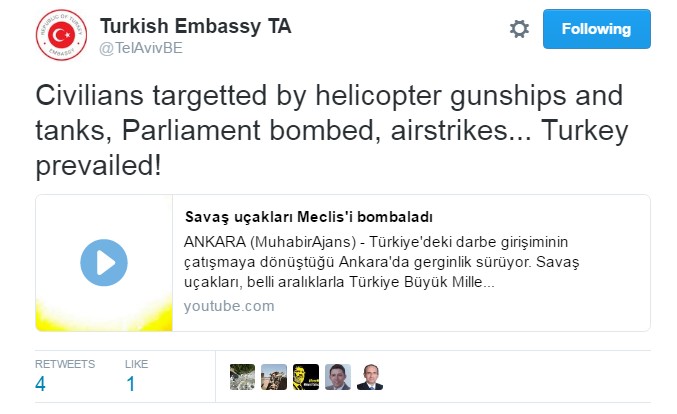 As such, the entire Turkish digital diplomacy apparatus was absent from the online discourse surrounding events in Ankara. 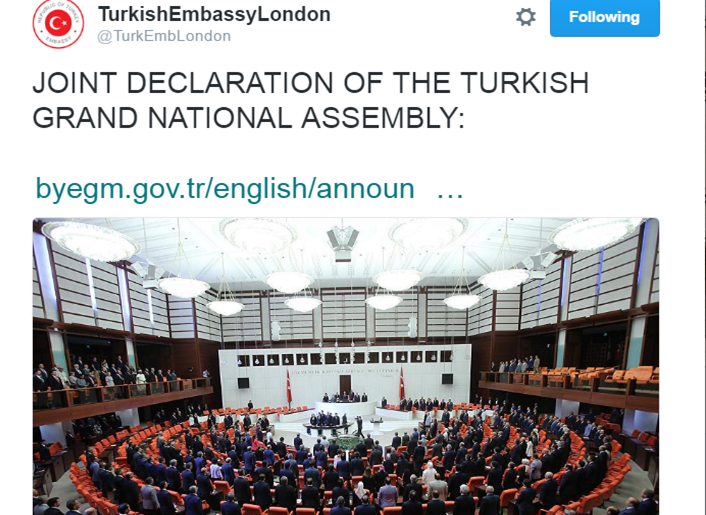 It was only on July 17 that Turkey broke its silence and embarked on a digital diplomacy blitz involving all Turkish digital diplomacy channels. Turkish ministries, embassies, news agencies and governmental accounts all shared a similar narrative of the coup and its aftermath. This blitz was truly global, as it included Turkish embassies in Washington DC, Tel Aviv, Cairo, Brasilia, Abu Dhabi and more. An analysis of Turkey's digital diplomacy blitz suggests that its narrative was comprised of four main themes. The first theme emphasized the fact that the Erdogan government was democratically elected and still enjoyed the support of the Turkish people. Tweets focusing on Turkey's democratic tradition, which can be seen below, may have been part of an attempt to counter accusations of an illegal purge. The second theme of the Turkish narrative depicted national unity following the failed coup attempt. Such tweets, which can be seen below, were meant to demonstrate that while Turkey was criticized abroad, it was united from within and that all parties in parliament share the same goal: stability. 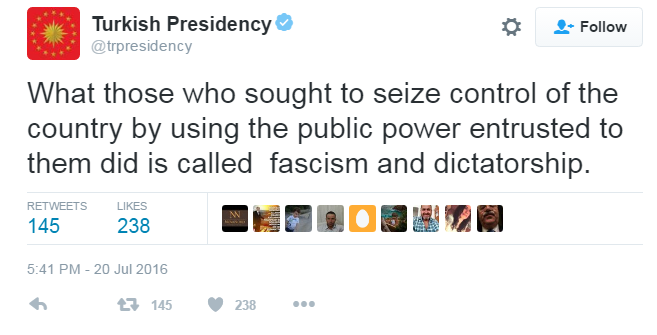 These tweets are also meant to remind audiences that Turkish opposition parties also denounced the coup. The third and most dominant theme in Turkey's narrative demonstrated the brutality of the coup soldiers. 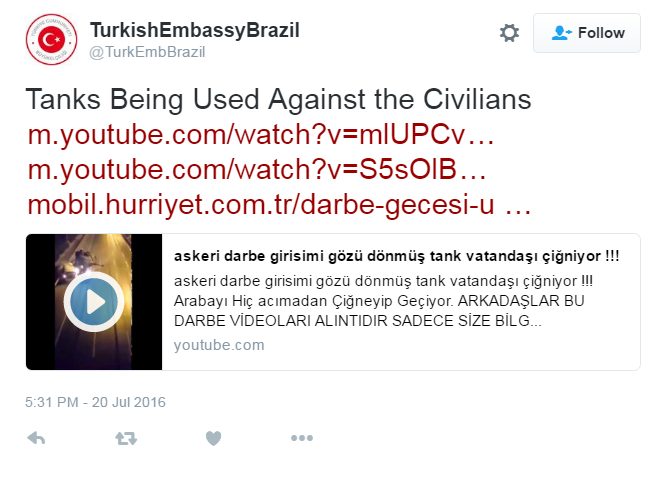 Turkish embassies in the U.S., Europe and even the UN all shared videos depicting the murders of Turkish protestors by coup soldiers. Such videos also depicted attacks on Turkish institutions such as the parliament, the presidential palace and police stations. 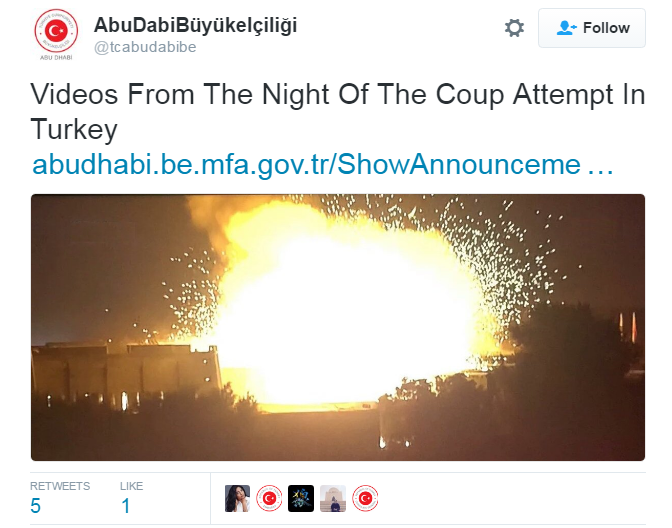 Tweets including these videos (screenshots below) may have been another attempt to portray the coup as an attack on Turkish democracy. These videos may have also served as a digital countermeasure to videos shared online depicting citizens lynching pro-coup soldiers. 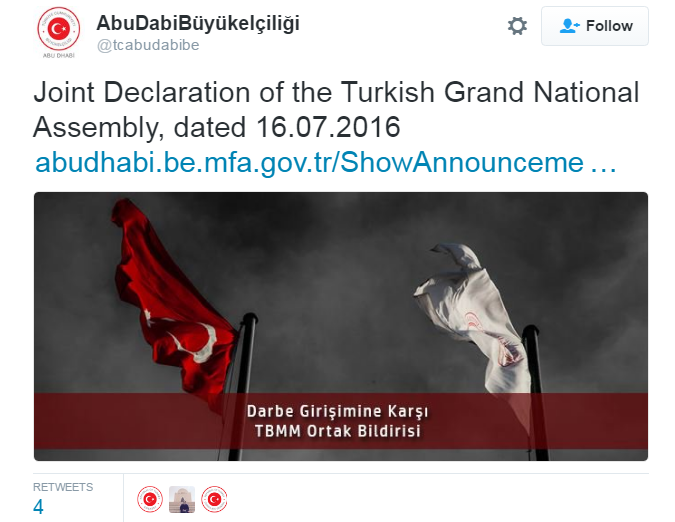 Finally, the fourth theme demonstrated international support for the Turkish government. Indeed, some embassies Tweeted messages of support from European leaders as can be seen below. 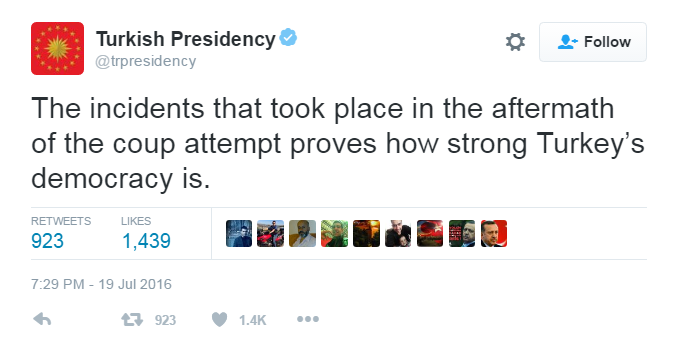 Yet by the time these tweets were published, most leaders had distanced themselves from the Turkish government. In summary, through its digital diplomacy blitz the Turkish government may have attempted to alter and shape the online discourse surrounding the political crisis in Turkey. In addition, this blitz may have been an attempt to reshape Turkey’s image and counter its portrayal as a democracy gone rogue. Yet as this blitz came 48 hours after the coup attempt, its ability to substantially impact the online discourse may have been very limited. Furthermore, as social media discourse informs the traditional media which informs foreign policy, Turkey may have been unable to stop the tidal wave of criticism from world capitals. Peer-to-peer diplomacy may be understood as instances in which citizens create or disseminate digital diplomacy content. Given that in recent days Turkey has been depicted both online and offline as a de facto dictatorship, social media users may have been unresponsive to its digital diplomacy blitz, viewing it as “Twipoganda” rather than “Twiplomacy.” This may be why recent days have seen the emergence of peer-to-peer digital diplomacy activities in Turkey. For instance, over the past week a group of young people have launched the VoicesofJuly15 Twitter and Facebook campaigns. Through these social media channels they have disseminated statements, videos and infographics explaining recent events in Turkey (see below). Some infographics ask social media followers "What would you do?" if a coup happened in your country. 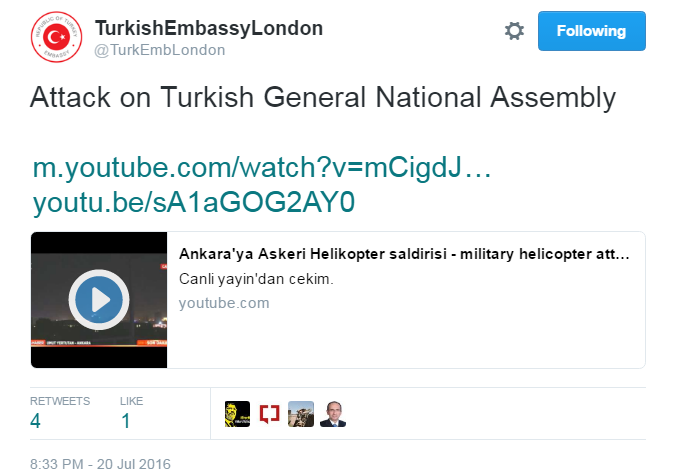 Other videos which have gone viral use humor to explain the coup to American citizens. The specific identities of those behind VoicesofJuly15 remain unknown, and it is possible that this account is also managed by the Turkish government, either directly or indirectly. This would not be the first time a government employed peer-to-peer diplomacy during a crisis: In 2014, the Israeli foreign ministry operated a student war room in which Israeli university students disseminated government content and messages from their personal accounts. These students did not identify as operating on behalf of the ministry and so the content they disseminated appeared to be self-authored.